Note: This post is part of The Music of Star Trek Blogathon hosted by Film Music Central and comes to the The Temp Track courtesy of guest blogger Brooke McCorkle. With Star Trek (2009), director J.J. Abrams faced a challenging task. First he had to guide the reboot of a series that has long been branded nerdy, weird, and too cerebral for mainstream audiences (as opposed to George Lucas’s Star Wars universe). Second, Star Trek hadn’t done so well in the preceding decade. 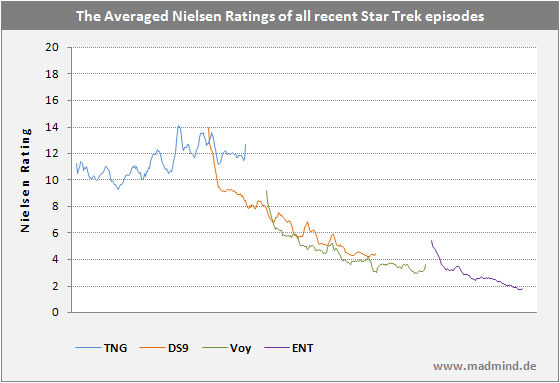 The television show Enterprise (2001-5) received harsh criticism and low viewer ratings (see here for a graph visualizing this drop). Star Trek: Nemesis (2002), the last Star Trek film before 2009, remains the lowest-grossing entry into the franchise.1Box Office Mojo Data Finally, the characters appearing in the Abrams film are popular culture icons strongly associated with the original actors, most notably William Shatner as James Tiberius Kirk and Leonard Nimoy as Mr. Spock. How would Abrams, along with writers Roberto Orci and Alex Kurtzman, reinvigorate Gene Roddenberry’s world and attract audiences? An excellent screenplay along with fine casting and acting contributed to Abrams’s success with the reboot. Yet, the original score by Michael Giacchino along with astute sound design and editing team that included Ben Burtt, elevated Star Trek (2009) to a significant film in the franchise. In this blog post, I want to talk about a specific aural moment that occurs before the movie even truly begins. The first sixty seconds of Star Trek (2009) establish a aural world that effectively expands fans’ understanding of the original series (TOS) while attracting new viewers unfamiliar with Trek. Giacchino’s music appears in the film before we even see the Abrams-Trek world; a horn intones a plaintive melody that becomes one of the score’s primary themes as the Paramount stars encircle the icon, followed by the Spyglass and Bad Robot logos. The horn crescendos on a “D” and is joined by the rest of the orchestra to a hard cut to the external shot of the U.S.S. Kelvin, where an infant Kirk is about to be born. It asks us to at once to forget the huge amount of labor and corporate capital poured into the reboot and accept the prolegomenon as a portal to the fantastic, the future, the 23rd century.2For more on music during these opening scenes and the establishment of franchises, see James Buhler, “Branding the Franchise: Music, Opening Credits, and the (Corporate) Myth of Origin” in Music in Epic Film: Listening to Spectacle, ed. Stephen C. Meyer. Heard before we glimpse the cinematic world it ostensibly reflects, this motif provides the foundation for the film’s score, and eventually, the new franchise. This first appearance of the score’s primary theme is unique though; it is in D minor (the saddest of all keys) and as a result incorporates several chromatic notes. The meter and rhythm is also curious; the cue can be notated to fit 4/4 meter but the syncopation at times gives the cue the sense of a very slow compound meter. The rubato by the solo horn maximizes the sense temporal uncertainty. Tinged with sorrow and unease, the motif reflects the general malaise of a millennial America. In this, it follows Star Trek’s tendency to speak to issues relevant to the time of its creation; in the case of 2009 (and the sequel, Star Trek: Into Darkness), the filmmakers grapple with the American dream in the post-9/11 world. Giacchino re-orchestrates, metrically manipulates, and adds various textures (including counter-melodies) to this cue throughout his Star Trek scores. For example, after the destruction of the Kelvin and Kirk’s birth, the motif returns in conjunction with the title card. Here, it is more more rigid in tempo and akin to a brass fanfare complete with percussion and strings. In this instance, the cue heralds us to the movie, solidifying the wisp of melody heard during the corporate logo. The cue is thus mutable; it evolves to suit particular situations and is able to work within various contexts. In this, it is the musical incarnation of James Kirk and eventually the Enterprise crew he commands. However its sense of direction and tonal resolution is relatively clear, and the use of the horn gestures towards heroism and the history of Trek. The Giacchino title cue subtly references the TOS one not only by its use of solo horn though. The penultimate measure of Giacchino’s 16-measure main motif contains the ultimate gesture to TOS. In it, the horn leaps in a descent from A to E, a perfect fifth. Heard on its own, any good Trekker will recognize this as the first two notes from the “Space Theme” introduction from the TOS title music. By alluding to the motivic and timbral world of TOS in the first seconds of his 2009 score, Michael Giacchino evokes a very specific musical “coding” that connects his work not to the film franchises necessarily, but to the very beginning of James Tiberius Kirk and of Star Trek itself. His opening cue musically establishes the setting and narrative approach of the Abrams’s films and beyond, just as the opening “Space Theme” and fanfare in TOS did fifty years ago. This first minute musically tells us that we are witnessing the inception of a new Trek world, with new life and new civilizations. The human adventure is just beginning (again). 2. ↑ For more on music during these opening scenes and the establishment of franchises, see James Buhler, “Branding the Franchise: Music, Opening Credits, and the (Corporate) Myth of Origin” in Music in Epic Film: Listening to Spectacle, ed. Stephen C. Meyer. 3. ↑ Jessica Getman, “A Series on the Edge: Social Tension in Star Trek’s Title Cue” in Journal of the Society for American Music, 9 (3) (August 2015): 302-3.